On the morning of this day in 2016, Prince, the polymathic musician who created more than 30 albums and won seven Grammy Awards over a 40-year career, is found dead in Paisley Park, his Minnesota home and recording studio. The cause of death was an accidental overdose of the opioid fentanyl. He was 57 years old. Prince Rogers Nelson was born on June 7, 1958, in Minneapolis, to musicians Mattie Shaw and John Nelson. As a teenager, Prince played in bands with his friends. In 1978, when he was 20, he signed his first record contract with Warner Bros., and that same year released his debut album, For You. Nearly every year after that he released a new album. Prince’s sixth studio album, Purple Rain, released in 1984, was a high point. The album spent 24 consecutive weeks at number one on the Billboard 200 chart, spawned two hit singles (“When Doves Cry” and “Let’s Go Crazy”), won the Grammy Award for Best Rock Performance, and sold 13 million copies. 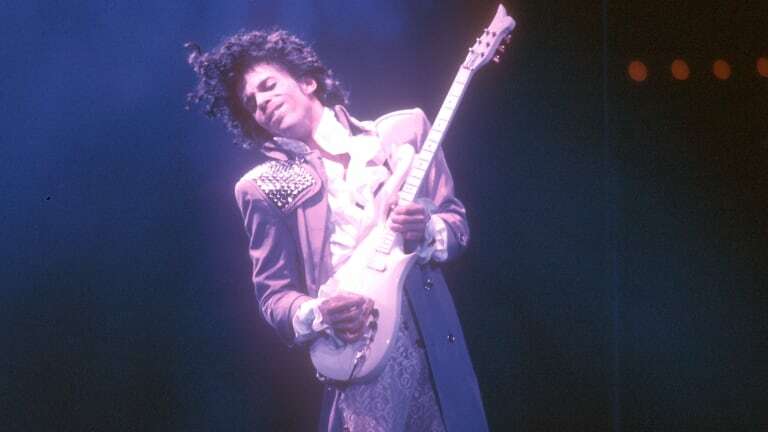 The accompanying film of the same name, which starred Prince in a loosely autobiographical role, won the Academy Award for Best Original Song Score. Both the album and the film’s success launched Prince to international stardom. Throughout his career, Prince defied and transcended genre. His music fused elements of funk, R&B, rock and pop into what later became known as Minneapolis Sound. Famously, he usually played all of the instruments on his albums himself—including 27 (ranging from piano to electric guitar to finger cymbals) on For You. He also toured frequently and was known as an especially electrifying live performer. In the years before his death, Prince had been taking prescription pain medication for chronic hip pain. It is believed he was struggling with opioid addiction. He still recorded and performed during this time. His last album, Hit n Run Phase Two, was released in December 2015. In October 2016, six months after Prince’s death, Paisley Park opened to the public for tours. In 2016, Prince’s estate sold more albums than any other artist that year, dead or alive.